As San Diego competes for the jobs of the 21st century, we need to ensure our children are receiving the education and skills to fill those positions. While the City of San Diego doesn’t have a direct role in the development of the curriculum taught to our students, our elected leaders play a vital role in ensuring we have an environment by which our children can grow and thrive. 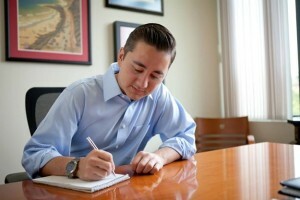 San Diego City Council candidate Chris Cate. Investing in our roads, sidewalks and bike infrastructure not only provides relief to daily commuters getting to and from work. but also to our youth who must get to school safely every day. Each day thousands of students venture through our neighborhoods, walking on streets without sidewalks or riding their bikes down roads without safe bike lanes separating them from cars and buses. Our police officers also play an important role in maintaining safe streets and safe schools that foster an environment focused strictly on learning. As reforms in our city continue, and economic growth allows for additional revenues to be used in our budget, elected leaders must understand investing in neighborhoods also benefits students throughout our city. As San Diego expands it prominence as a worldwide leader in the biotech and life sciences fields, companies locating and expanding in our city need the workforce to fill those jobs. In order for local students to fill those positions, they need to be receiving the education and experience to rise above others across the globe. Industry leaders in San Diego have begun developing STEM programs to target students. CONNECT’s Entrepreneurs 4 Young Innovators program is specifically targeted at matching local CEOs and entrepreneurs with students to inspire them to enter the fields of life sciences and technology. Our city must continue to work with our schools and local companies to develop and expand STEM programs that not only teach kids in the classroom, but allow students to apply their knowledge and skills outside the classroom. In fiscal year 2013, nearly 6 million visitors walked through our city’s libraries with over 8 million visiting the system’s website. For the upcoming year, Mayor Kevin Faulconer has proposed expanding library hours at each branch by four hours a week, and investing half a million dollars in the Do Your Homework @ the Library after-school program. This is a great start for our new mayor, but work must continue. This expansion of library hours brings the total hours of operation at our libraries to 48, up from 44 per week. As elected leaders, we must continue to be vigilant in finding ways our libraries can be open for longer hours during the early evening throughout the week, as well as open longer on weekends to allow for a safe environment for students to complete their homework over the weekend. Other options include expanding partnerships with other venues and non-profits to provide before- and after-school programs that allow for a safe environment for kids. Programs like “After School All Stars” and others at our local YMCAs and Boys and Girls Clubs are vital because of the work they provide in the neighborhoods and the relationships they build with children. As our students get older, it is important for them to begin obtaining the job skills that will allow them to enter the workforce ready and able to succeed. The San Diego Workforce Partnership’s CONNECT2Careers program is poised to receive additional funding under Mayor Faulconer’s proposed budget. This is a program the city has invested in to give students the opportunity to obtain work experience during the summer at some of our city’s leading companies. These students also need to have the knowledge and experience of working with new technology. It is important that our schools and the city establishe partnerships to allow students to have the technology and tools to succeed outside the classroom. Because District 6 is home to San Diego’s growing tech and life science industries, I will make it a priority to collaborate with leading companies to establish additional mentoring and job training programs for our up and coming youth leaders. As the councilman for District 6, I will work to ensure our city partners with our schools and industry leaders to not only create a safe learning environment for our students, but to also give them the skills they need fill the jobs being created here in San Diego. Chris Cate is vice president of the San Diego Taxpayers Association and a candidate for San Diego City Council in District 6.